Racing the OC Duathlon this year brought a lot full circle for me. This was actually my first ever multisport race in 2010. That year it was a 5k run-37k bike-5k run and this year it was a 2k run-37k bike-10k run. In 2010 both runs were pancake flat while this year the second run was a very hard hill climb run with a challenging bike. This was basically my A-race for the year without fully declaring that in my training, even though I've still been swimming consistently considering this race had no water involved. This race was also a qualifer for the World Duathlon Championship in Ottawa in August. I think this is the real reason I signed up, I wanted something different and some goal around it. Waking up race morning I had a slightly high blood sugar just over 200. Not ideal race morning. I drew up the insulin, gave myself the injection and went on my way setting up transition nice and early. Double arrows up on my continuous glucose monitor (CGM), my blood sugar rocketed well past the 300 line and kept going up. I checked to make sure it was right and gave myself a slight correction. Problem was.... it kept going up. Even after setting up transition it was still on the rise and by this point I could feel it. My stomach turned to knots and the lethargic feeling set in. I took my blood sugar again, still over the top high and gave myself another correction. Jamie wasn't with me at this race so I was alone. I text my Dad first knowing he would be awake two time zones away then Jamie. In reality I was looking for the "it'll be fine", "go win one for the gipper", encouragement I knew I would get. I told Jamie I would start and see how I felt by the end of the bike. At this point I was definitely spilling ketones in my urine and decided if that kept up I would pull the plug. I ran twenty minutes for a warm up with high hopes (literally high hopes) that my skyrocketing blood sugar would come down. It seemed to level out somewhere in the 300's before the gun went off for the 2k start. The race was off. My stomach was in knots but I seemed to hold my desired pace. It was an out and back to transition. Down on the way out, up on the way back. Running shoes off for the bike. During the first run I couldn't imagine how I would keep up with that blood sugar. 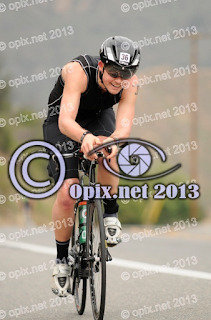 Some where in the first two miles of the bike a miracle happened and I felt fine. I think that's the beauty of racing. The adrenaline takes over and you can do things as long as your mind can imagine it. I kept telling myself to stay in the moment and all would be fine, turned out it was. 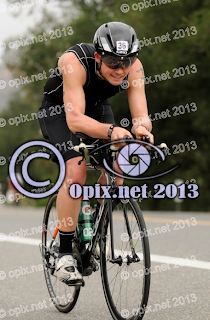 About twenty minutes into the bike I felt my CGM beep that my blood sugar was crashing. Perfect I thought, now I can have a gel and level it off. I ate two gels and rode. I felt great riding, I was holding the power numbers I wanted and told myself I was having a good race. Then I tested while riding another twenty minutes later, now forty minutes into the bike. Still in the 300's. The number on the screen shocked me. It didn't matter. I felt good. I would cruise into transition and test again on the run. At this point who knows how I felt. I tested the first mile on the run while holding my pace, 320. I pulled a syringe out of my tri kit and threw three units into my leg. I can't imagine it took more than two total seconds. I had forty minutes left of this race and I wanted at least one more gel for energy to finish. I hit the lap button on my watch and took the last gel fifteen minutes after the injection (roughly the time insulin takes to get in the system). The run on this course is brutally hard. A slight down hill for the first two miles then a monstrous climb for the next few miles to the finish line which is at a different point from the transition area. I finished the race incredibly strong for everything that had happened. The last mile for me was brutally tough, my body finally having enough. I ended the race with my blood sugars in the high 200's, nearly double the blood sugar of all the other competitors. I can honestly say this may be one of my proudest races. In the moments I should have felt like death I felt good. I kept in the moment and didn't worry about why my blood sugar could be so high or how it was negativity affecting my current world. Blood sugars can be a state of mind as much as a real number. Even with that blood sugar I qualified for the age-group duathlon world championships. I won't be taking the spot as it is the same weekend as my planned bachelor party (don't worry friends, we are still going to Vegas). I finished in 2:05 with a 1:08 bike and 0:48 run. I'm not completely positive why my blood sugar went through the roof like that. The only real logic I can come up with is that I didn't give myself the full dose of insulin at 4:30am. For a race I normally lay out the syringe with the insulin in it the night prior. This time I didn't. Race lesson, lay out the insulin the night before. 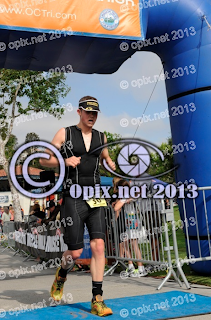 I had to walk two miles back from the finish line to transition. Halfway two friendly women in a Lexus SUV with a roof rack holding a bike stopped and yelled, "do you want a ride to transition". I responded "my mother would kill me if I got in that car". Mary-Beth and Beverly (as I learned their names were) responded; "honey we aren't going to do anything to you". I said I didn't know if I should take that as a compliment or be offended. Then I promptly took the ride. My mother would be very disappointed with me getting in that car but I couldn't resist.